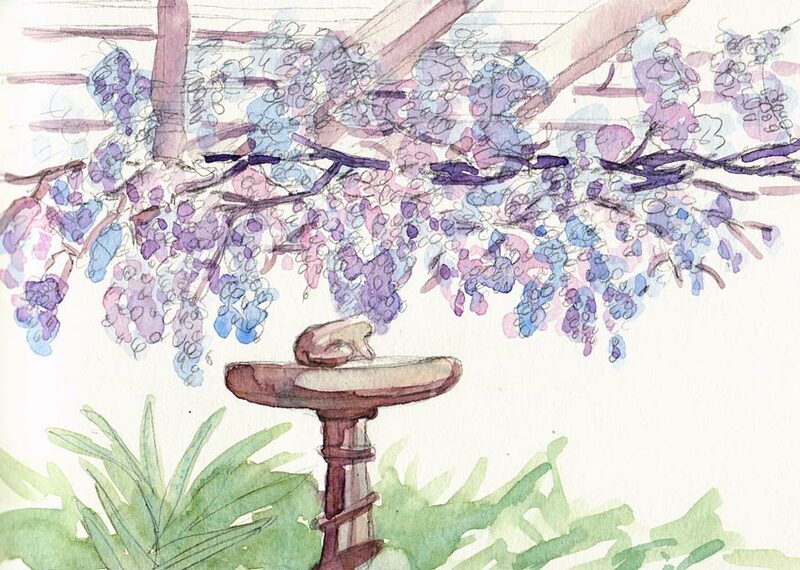 My plein air painting buddy Cathy, invited me over to sketch her wisteria which was blooming in her beautiful, backyard Zen garden. Cathy is a graphic designer and her wonderful design sense is apparent throughout her home and garden. I loved being in the presence of the quiet empty spaces, balanced with beautifully designed sculptural installations of plantings, ceramics, orchids and bonsais; and Japanese style fences, stones used to simulate streams and landscape features. With a fountain tinkling, bees visiting the wisteria and hummingbirds sipping from the fuchsia while we sat in the shade sketching, it was a wonderful way to end the day feeling relaxed and at peace. What a wonderful experience….your wisteria is lovely. You reminded me that we have a brownstone several blocks away with wisteria that blooms all over the 4 floor house front. I’ll need to walk by to see if it is beginning to bloom yet. a lovley wisteria, I adore their volour! Does the fragrance of a wisteria come out more at night? I was sitting in a book group the other night and couldn’t focus on the discussion because of the seductive smell from the arbor just out the window. Cathy’s garden looks and sounds like a beautiful place. I like the way the light is hitting the birdbath or froggy pedestal. I love your peaceful description of the place you were painting. That’s what I love about painting outdoors. There is all the seductive color, nature sounds and smells and the peaceful feelings of doing something good for our souls and usually there is no language or demands by others. Thanks for sharing your painting. Lovely! The wisteria is out here too, and I’ve been planning to paint it all week – the all-flower stage lasts such a short time. Thanks for the inspiration – I’m going to do it now.